Following its world premiere in Berlin, the new Mercedes-Benz Actros has since celebrated its trade fair premiere at the IAA Commercial Vehicles in Hanover. With more than 60 technological innovations, the design of the new Mercedes-Benz Actros has also seen a big change. Especially noticeable is the absence of regular exterior mirrors. Instead, the new version of the heavy-duty truck comes as standard with the dynamically designed MirrorCam and thus benefits from more homogeneous proportions. 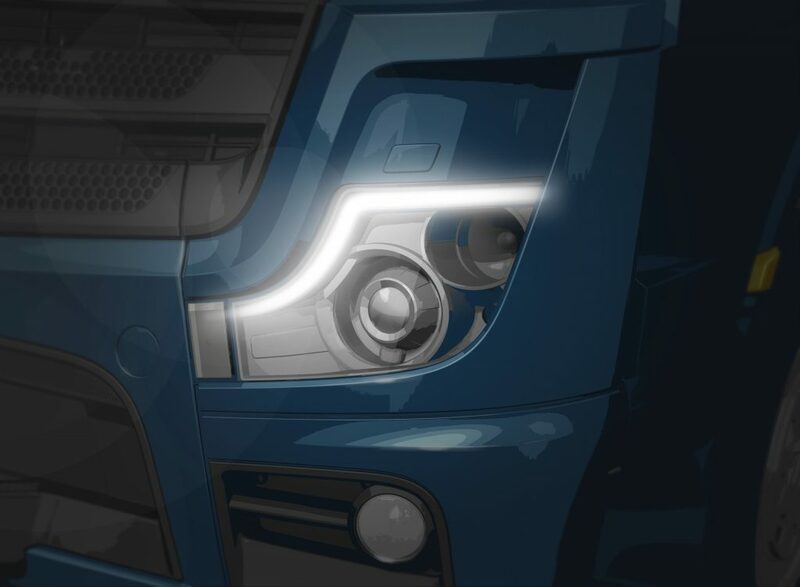 The typical front headlamps with LED daytime running lights also contribute to the progressive look of the truck: the new, flowing light signature on the upper headlamp edge makes the Actros unmistakeable at night. During the day, the new, standard LED daytime running lights help ensure that the Actros is as conspicuous as possible for other road users. Besides the advanced exterior, the modern truck interior is also a key feature in the design of the new Actros. The new Mercedes-Benz Actros boasts homogeneous proportions and a progressive interior design. In the new Actros, the interior design was resolutely designed around the driver’s needs – “inside-out” to put it another way. Formative for the design process was thus the “User Experience” of the driver. And this can be seen best in the Multimedia Cockpit. Two free-floating, extremely high-resolution displays replace the traditional cockpit. They can be controlled using the touch-pads integrated in the redesigned steering wheel. The secondary display, meanwhile, also features touch-screen technology for direct operation. But the representation on the displays isn’t just a functional experience; it also enhances the emotive appearance and the comprehensibility of the operating structure whilst impressing users with brilliant, pixel-perfect graphics. The operating concept of the displays features a three-level approach with increasing information density: the upper-most level houses the home screen. With just a single operating step, users are taken to the main applications, for example the radio or navigation system. Fleetboard functionality has also been included in the secondary display. And the integration of external apps, for example from body manufacturers, is also possible here. The Multimedia Cockpit of the new Actros is part of the standard equipment and features a 10-inch primary display. An optional variant, the so-called “interactive” Multimedia Cockpit, comes with a 12-inch screen which delivers a broader scope of functions: the driver can, for example, select one of three different display concepts. In the “interactive” Multimedia Cockpit, functions of the assistance systems, such as Predictive Powertrain Control (PPC) and Active Drive Assist (ADA), can be called up and monitored with ease. The touch-screen displays and the large displays in the A-pillars for the rear-view mirror function also highlight the highly modern appearance of the Actros. They shape the interior of the new flagship from Mercedes-Benz Trucks and are accompanied by a choice of “high-gloss ash wood”, “brushed aluminium” or even “glossy carbon-fibre-look” trim elements. There are only very few analogue switches left in the interior of the new model. The extremely modern interior is rounded off by the new interior lighting concept. Two reading spotlights in warm white illuminate the entire cab while a discreet blue night-light facilitates orientation in the cab at night. Additionally available is the ambient night-time driving light, which illuminates the footwell and cockpit in blue, as well as a living area light in amber with light alarm clock. This provides for a homely atmosphere and top-level comfort. “Design-wise the new Actros is revolutionary. The focus is no longer primarily on the exterior– namely iron and steel. The interaction between driver and truck is now more the focal point. This becomes obvious as soon as you see the new interior. The new design is cleanly modern and together with the new HMI is absolutely high-tech and digital. Aside from the MirrorCam, the LED daytime running lights on the exterior make the new Actros instantly recognisable,” is Gordon Wagener’s, Chief Design Officer at Daimler AG, accurate summary. NEUTO Review - Will this make your car cleaner and more efficient? Can an autonomous log carrying lorry prevent accidents?